Philadelphia Phillies 2019 rest of season hitter projections including projected fantasy baseball values. Philadelphia Phillies rest of season pitcher projections including projected fantasy baseball values. Philadelphia Phillies probable pitchers with projections for next 7-10 days. Subscribe for all daily pitcher projections w/ fantasy baseball values and DFS MLB $/Point. As low as $4.99/month! Philadelphia Phillies hitter projections for today's game. Updated when lineups post. Subscribe for all daily hitter projections w/ fantasy baseball values and DFS MLB $/Point. As low as $4.99/month! Philadelphia Phillies last 7 day hitting stats with fantasy baseball values. Philadelphia Phillies last 30 day hitting stats with fantasy baseball values. Philadelphia Phillies 2016 hitter stats and fantasy values. Philadelphia Phillies last 7 day pitching stats with fantasy baseball values. Philadelphia Phillies last 30 day pitching stats with fantasy baseball values. 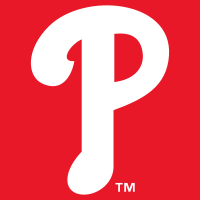 Philadelphia Phillies 2016 pitcher stats and fantasy values.